Losing weight with a dog is the most fun weight loss programme that exists! Find out more in today's article. When it comes to being healthy and fit, there are many forms of exercise that can help us. However, few things are more fun and productive than losing weight with a dog. Carrying out exercise with your pet strengthens your bond with your furry friend, and improves both the owner’s and the pet’s health. It is clear that people who have pets are more active than many other people. 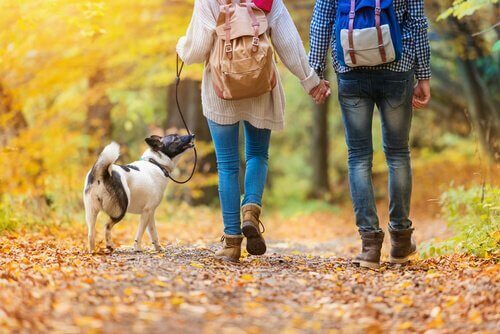 Even though they don’t participate in any specific sport, the mere act of walking with a dog every day makes them less sedentary. 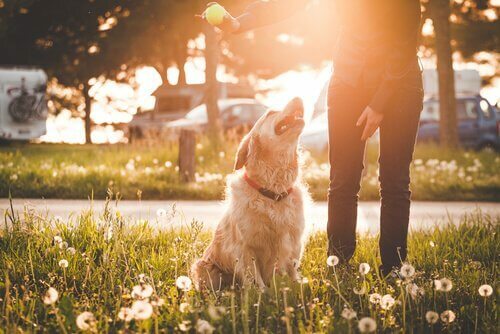 Losing weight with your dog has emotional benefits too. Some specialists point out that pets act as motivators during exercise routines. Doing exercises with an animal is ideal for sedentary people and also for sports novices. Exercise improves circulation and the respiratory system, thereby decreasing potential heart risks. It fills you with energy and stimulates the body’s nervous system. Exercise is also beneficial for animals. It strengthens their muscles and bones, improves the condition of the heart, and reduces risks associated with a sedentary lifestyle. 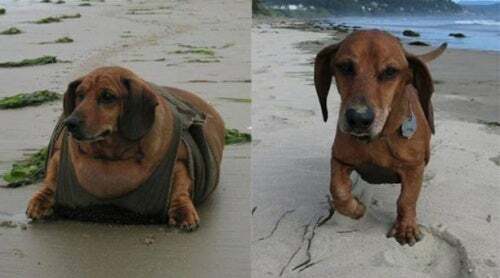 Another important benefit of exercise is that it combats obesity, which is typical in adult dogs. Any activities that you carry out together with your pet will benefit your relationship. They strengthen the bond and the communication between a dog and his owner, a fundamental aspect of living together. Needless to say, for animals, exercising is like a game and you can be sure that he will always have fun. One way to keep him interested is to reward him at the end of the routine with a cookie or his favorite food. Having pets usually improves your mood. Playing with animals stimulates the production of serotonin and dopamine, which increases one’s feeling of happiness. In turn, this will help to decrease depressive states or feelings of loneliness. In addition, sharing time and activities with a pet reduces stress and its consequences. The mere act of exercising helps to alleviate the accumulated stress. In the case of people with degenerative or chronic diseases, animals fill them with hope and a reason to live. They become a primary source of motivation which helps them to overcome the effects of the disease. 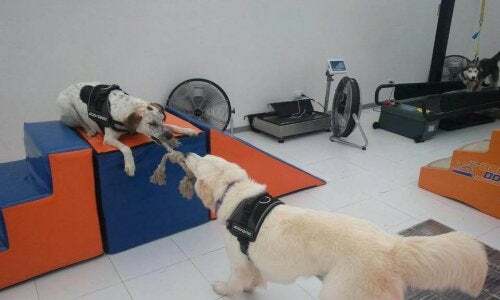 Dogs become people’s exercise partners, and, psychologically, it is a factor which helps them take part in the routine. In fact, there are some forms of exercise that directly involve the animal. For example, doga, which is a variant of yoga with dogs, and also relay races. Before starting any athletic activity, it is important to know the human and the animal’s physical condition. A general medical checkup can determine if the person is able to do physical exercise. In the human’s case, your cholesterol and triglyceride levels must also be evaluated, and also your cardiac output. This is key, especially if you haven’t done much physical activity in the last three years of your life. If you’re interested in a specific discipline, the checkup is likely to be more detailed. For example, if you want to run, then specialists will have to evaluate the condition of your legs and knees. The same goes for the animal; so, at the checkup, the veterinarian can determine if the dog is fit for training. It’s important to bear in mind that some breeds have a greater predisposition towards exercise. For example, German Shepherds and Labradors are ideal for training for races, and it is highly recommended for Retrievers too, whose physiques are prone to obesity when they age or eat too much. On the other hand small dogs, such as Beagles or Yorkshire Terriers, should have calmer routines. 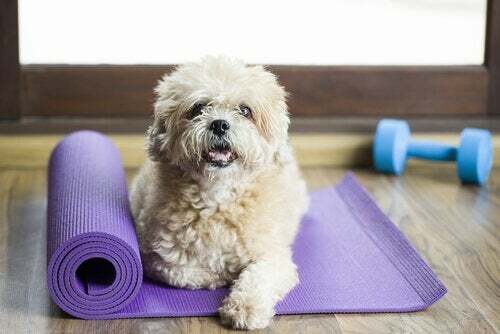 In the latter case, yoga or Doga is the ideal exercise routine for losing weight with your dog. Any training must be introduced gradually for both the person and the animal. The best way is to increase the exercise gradually. For example, if you are going on walks, you can take two 15-minute walks daily. After a week, this walk can be extended to 20 minutes, or you can include another additional 15 minutes. If you want to accelerate the pace, you can alternate walking with jogging. However, don’t forget your pet’s condition when you want to increase the intensity.